no need to look for an open retail point. tickets’ prices are exactly the same as for paper tickets. 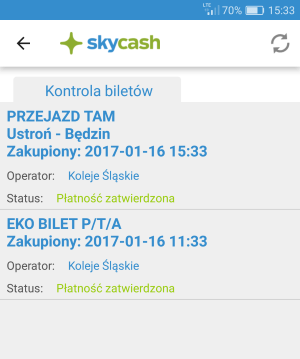 Using SkyCash mobile application allows to buy disposable ticket for all connections provided by Koleje Śląskie. However, we are currently working on introducing also other tickets into our offer. To buy a ticket you only need to run SkyCash application, then search for connection, choose the number of tickets, type of discount and decide about returning ticket. SkyCash application has an option of issuing invoices. The documents are being sent in PDF format into your e-mail address. The system provides the option of fast returning of a ticket. Everything is done online without going to ticket retail point. Do you prefer to control your spendings through the prepaid SkyCash wallet or rather comfort of paying directly through your bank account? You can find both of the methods by choosing “+Doładuj Konto” tab, placed on the main screen. After opening the bookmark choose the most suitable one from available methods and follow further instructions. … then select the city of departure and your destination. Choose the time of departure and a count of tickets according to the tariff – normal or reduced. If you chose at least one reduced ticket, specify the type of discount in the given list. If you need to, select „Bilet powrotny” to buy a two-way ticket. Choose „Szukaj” tab. Choose the offer from the following list. If you travel with a dog, a bike or you have luggage, mark an appropriate checkbox. On the „Podsumowania biletu” screen, check the correctness of given data. If you want to correct something, go back by choosing the arrow on the left, top corner. If everything is correct, type your name, last name and data of your identification document, used during a ticket control on the bottom of the screen. To confirm, touch „Zapłać” tab. 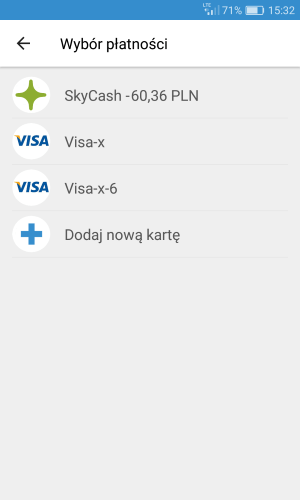 You can make payments for Koleje Śląskie tickets by using SkyCash wallet or your VISA/MasterCard card. After choosing the method, confirm your purchase by typing an appropriate code. In the case of SkyCash wallet it is the PIN code that was set during registration. If you choose your card, you will need CVC code, placed in reverse of the card. … find and choose your ticket. Show the 2D code with details below it to the controller. This action does not require internet connection in your phone. To receive an invoice for your ticket, in „Kontrola biletów” bookmark select your bought ticket, then on the bottom of the screen choose „Faktura VAT”. At the end type all invoice data and select „Wystaw”.